Our April 15 edition of Page Presents featured one of my favorite books, Cool Daddy Rat, by Kristyn Crow and illustrated by Mike Lester (Lester received the National Cartoonist Society’s Ruben Award for Book Illustration for his jammin’ and jivin’ illustrations for this book!). Earlier in the week I had presented three back-to-back story times for a nearby daycare, in support of their Family Literacy Week, and had gotten an enthusiastic response. Those kids were scatting with the best of them! On Friday, Mr. Matt brought his drum set to add authentic atmosphere, which was really fun! 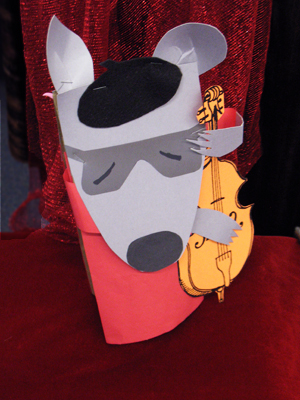 Stuart had made an excellent cardboard double bass, and also lent a pair of sunglasses . With a beret from Barbie, a sweater from Zoom, and a coat from Paddington, Cool Daddy Rat was ready for his marathon series of gigs. Ace borrowed a handknit sweater and some shades, and he was ready to stow away in his cool daddy’s bass case. I cut a skyline from one of my big Stendig calendar pages and draped my puppet theater in dark fabric, and we were transported to the city that never sleeps! I found myself doing an impromptu mime performance, since I realized that the kids would have no idea what would be happening when Cool Daddy Rat’s music “made a mime stare in Times Square.” This job certainly stretches me in all sorts of unexpected directions! After the story, the kids made paper bag puppets. So for our Cool After School class on April 13, we experimented with writing our own concrete poetry. Create your own visual poem with RoboType—or just experiment with some fun typography! There is also a cool letter recognition game based on Kurt Schwitters’ book, Die Scheuche Märchen. 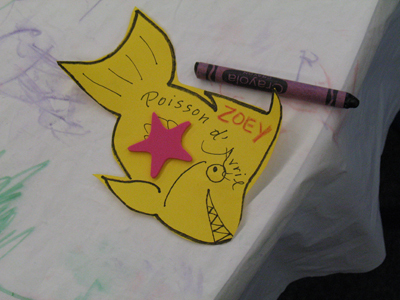 For our Page Presents class on April Fools Day, I really wanted to do something related to the French tradition of Poisson d’Avril (literally “April Fish”). So I started looking for a good “fish story.” I found it in Kumak’s Fish: A Tall Tale from the Far North, by Michael Bania. It’s a variation on the story of The Giant Turnip/Carrot/Potato/Sweet Potato, a favorite of storytellers everywhere. I set up my puppet theatre next to the open door of our story closet to create a hiding place, and I covered everything with a white sheet and shimmery lavender fabric to represent snow and ice. I played the part of Kumak, who declares, “It’s a good day for fish!” Kumak’s Uncle Aglu is feeling too creaky to go along, but he lends his magic hooking stick to Kumak. Everyone knows that Uncle Aglu, with his magic hooking stick, catches more fish than anyone else in the village. Kids eagerly volunteered to play the parts of Kumak’s wife, his wife’s mother, and his children. We all mimed putting on our anoraks, and pulling on our mukluks and big gloves. Then I packed everyone into our pretend dogsled, and we drove to our fishing site and went to our respective fishing holes. I had a model of Uncle Aglu’s hooking stick, and everyone else had a pretend hooking stick. We all had to be very quiet and very patient so the fish wouldn’t know we were there. Soon everyone in Kumak’s family had caught a fish, but Kumak hadn’t had a bite. But he continued to fish, quietly and patiently (I had flung my line over the puppet theatre). Everyone gasped when they saw my line go taut! Stuart (in the Giant Fish costume) had hidden before everyone arrived, so it was a nice bit of magic. In the story, Kumak is nearly pulled into the water, and his whole family (and eventually the whole village!) joins in the tug-of-war. After some dramatic movement away from the fishing hole, and then almost getting pulled in, Kumak and the line of family and villagers, all holding on to each other and not letting go, pull up an identical line of fish all holding on to each other and not letting go. In my April Fools version of this fish story, a gigantic Poisson d’Avril (wearing a Poisson d’Avril sash) gets hauled up at the end of the line of fish. Just now catching up! Our March 30 Cool After School class featured the camera obscura (Latin; “camera” is a “vaulted chamber/room” + “obscura” means “dark”= “darkened chamber/room”). Leonardo da Vinci described this phenomenon in his notebooks, and, inspired by the book, Amazing Leonardo da Vinci Inventions You Can Build Yourself, we constructed small personal pinhole cameras from Pringles containers. Then we made two larger versions. One was made from a medium-sized box like the one illustrated above, and the other was made from a large wardrobe box that allowed a person to stand inside. It was exciting to see the images projected on our screens! Follow this link to an article from National Geographic on turning a room into a camera obscura! Watch this Youtube video from the Exploratorium to see the setting and exterior of the giant camera obscura in San Francisco and the interior with the ocean scene projected on a table sized screen. The periscope-like lens can be moved to scan the coastline. Our April Origami Cool Zone workshop featured the traditional crane and a crane basket. Folding the crane basket was challenging for some of the less experienced folders, but everyone mastered the traditional crane! On my way to the Washington Library Association conference, I discovered an origami challenge in Southwest Airline’s flight magazine, Spirit—a five-dollar bill ostrich designed by John Montroll! I didn’t have a five-dollar bill, but I acquired one after arriving in Yakima, and I wrestled with this fairly advanced model until I figured it out. The theme of the conference was “Libraries Take Flight,” and all of the interest groups had decorated their tables accordingly during the first evening’s social event. RIG, the reference interest group, was challenging all comers with an origami owl as well as a trivia contest. On the way home, I had a nice, crisp five-dollar bill, so I folded one more ostrich. Soon I’ll post the photos from our April origami workshop. We folded traditional origami cranes, as well as lovely crane baskets! My travel luck was holding. Betha and I made it across Snoqualmie Pass last week about forty minutes ahead of an avalanche that closed I-90 for hours. On our way to the Washington Library Association conference in Yakima, we stopped off in Ellensburg to visit the lovely public library. What a delight it was to see all the public art in the library and around town. Best of all was running into that charming rascal, Ma’ii (Kitt Coyote, by Richard Beyer). He’s always good for a story. The spring weather and the heady creative mix at the conference blew all the wintry cobwebs out of my brain and reminded me of a poem I wrote in 2006, while living on the Navajo Nation.